A mixed season. Early on warm conditions are expected. 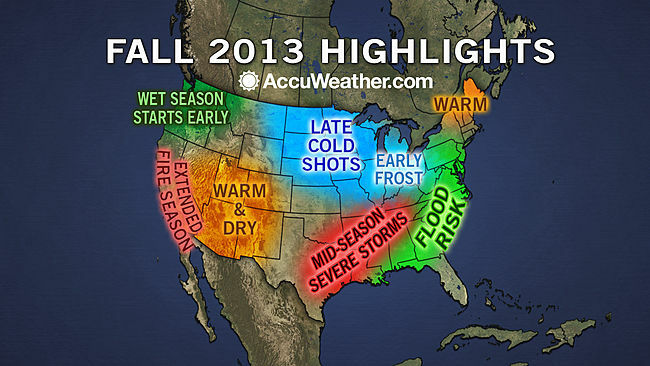 During the middle of the season the focus is forecast to be on unsettled and possibly stormy weather. Later on increasingly cold conditions could develop in the north and possibly extend south for a time. Temperatures are expected to be close to or slightly above the long term average over the three month period. Close to or slightly above average. A generally fine start to the month is expected with temperatures well above the season average, especially in the south. The mostly dry conditions are expected to last through the first week. Through the second week increasingly unsettled weather is expected to return from the west, with showers or longer spells of rain affecting all regions. Temperatures becoming close to the average. The second half of the month looks like bringing a mixed bag of weather. Some warmer and drier interludes are likely, but also unsettled and windy spells of weather. Overall this period is likely to bring close to average conditions. A reasonable start to the month is expected with temperatures climbing above the seasonal average. Possibly becoming rather warm for a time before the rather settled conditions gradually break and are replaced by increasingly wet and windy weather. Temperatures trending back towards the seasonal average later in the period. Unsettled weather is likely for much of the time during the second half of the month and at times it could become very windy or stormy, especially in the north and west. 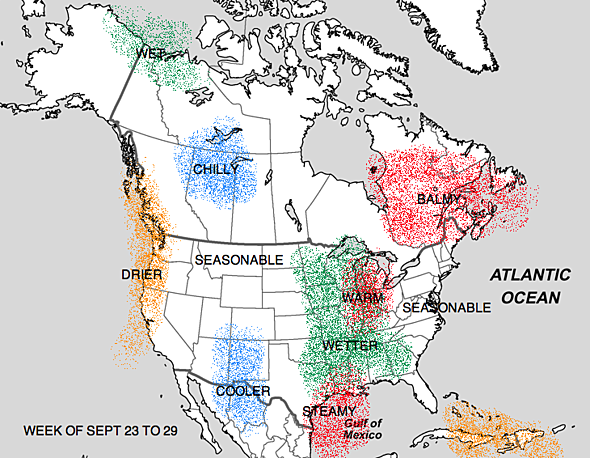 Southern regions should continue to see drier interludes, but it is expected to be often unsettled. Temperatures mostly close to average. A good deal of unsettled and windy weather bringing widespread rainfall and windy conditions at times, with the wettest weather likely in central and southern regions. Temperatures should often remain close to the seasonal average in the south, but colder in the north with an increasing risk of frost and sleet or snow over high ground in Scotland. Unsettled and at times cold weather is expected to affect most of the country, with widespread showers or longer spells of rain. Possibly becoming cold in northern regions with a risk of snow. Wintry conditions could extend could extend south for a time with frost becoming widespread. 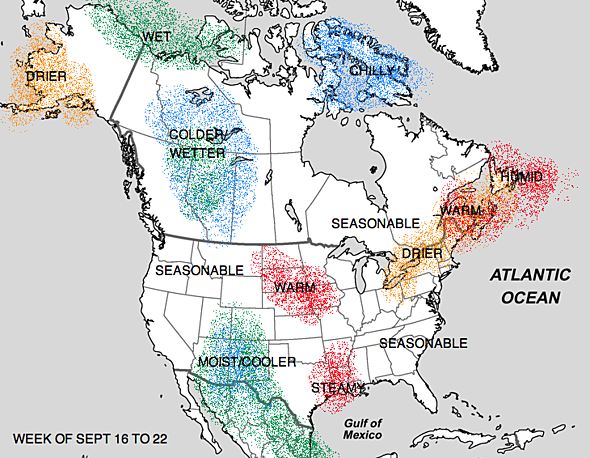 Temperatures during this period are likely to be below the seasonal average. Sound like a stormy Autumn coming up for the UK with a possibly wintry end? Lets hope so! The start of Autumn is currently expected to be a fairly benign one with plenty of settled weather on offer. The pressure map below gives a good indication as to why, with pressure generally a little higher than average across the UK, but not significantly so and as is often the case the northwest of Britain is likely to see more in the way of unsettled weather than regions further south and east. Overall temperatures are expecting to be close to or above average, with a generally drier than average month likely - abeit with some local exceptions possible. Into October, the forecasting model is again showing a month with higher than average pressure across much of the British Isles, but with some subtle changes to the pattern. These changes suggest that temperatures will fall away from the warmer than average months we've seen of late to be below average in many regions. Rainfall is again expected to be below normal levels for the majority. As we close out Autumn and move into November confidence in the forecast at this range does really start to fall away but at this stage with a strong high pressure anomaly to the north of the UK being shown this would point toward a cooler/colder than average month with rainfall levels generally ranging from close to average in the south to below average further north. Lots of uncertainty at this range though, but the pattern for high pressure to the north of the UK (northern blocking) is something to watch and is a pattern the model is keen to continue into the winter months. Doesn't look very cold or exciting. 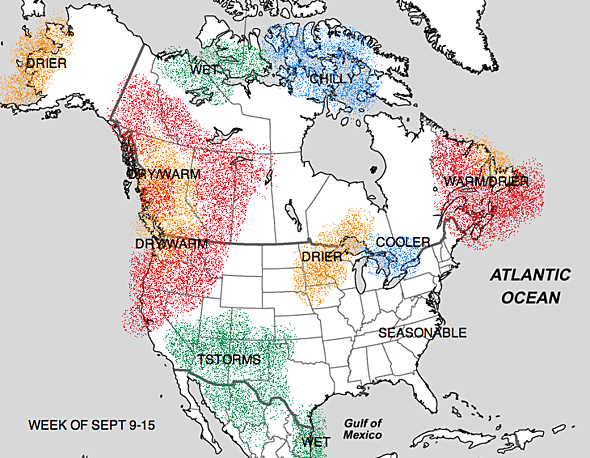 Here is my latest long-range weather pattern projections through the end of September. These weekly outlooks are based on current observations, short-term atmospheric oscillations, teleconnections and ECMWF model data. They're talking about a potential atlantic blocking during December and late November. It looks like our first frost is going to be on Friday. I haven't seen these before, but they are exactly like my gut feeling predicted. Average Sep, above average Oct and Nov.
Finland: slightly above average, especially in the South, above average precipitation. ECMWF for Finland: Mean temp higher than average in Sep-Nov, biggest anomaly in Eastern and Northern parts. Precipitation average or slightly below. • UK – Cooler than normal"